The murmur begins. The talking becomes louder. It is repeated. Who will serve as director? Who will serve as president? In many communities, associations go begging for volunteers to serve. You have heard the plea, “Please serve as director so that idiot [fill in your favorite name] will not automatically be elected!” Frequently, a member grudgingly consents only when it is obvious that there is no one else available, willing, or capable to serve. We can hem-and-haw about why there is this state of affairs. Though it provides no solace, community associations are in no different shape than many other volunteer organizations, whether civic, religious, or charitable. What is taking up everyone’s time and energy is a topic for another essay. Qualities to serve as director do not have to be uniform among all applicants. In Florida, a not-for-profit corporation is required to have at least three directors §617.0803 Fla. Stat. (2016). A condominium association shall have at least five directors unless the by-laws provide otherwise or the condominium has five or fewer units, §718.112(2)(a)1 Fla. Stat. (2016), as does a cooperative association, §719.106(1)(a)1 Fla. Stat. (2016); interestingly, the Homeowners Association Act, Fla. Stat. Ch. 720, does not have a similar provision. There are some objective requirements, which may actually disqualify a person seeking to be a director. First, a director must be 18 years of age or older pursuant to the Florida Not-for-Profit Corporations Act. §617.0802 Fla. Stat. (2016). It is recognized that some not-for-profit corporations, primarily charitable organizations that address youth matters, may have a teenager on their board of directors. There are special provisions in the Not-for-Profit Corporations Act that specifically exclude condominium, cooperative, and homeowners associations from allowing directors younger than 18 years of age. Second, a director may not have been convicted of a felony in Florida, in the United States, in a district or territorial court, or in another location in which the offense would be considered a felony if committed in Florida. The felony prohibition is not applicable if the person’s civil rights have been restored for at least five years before the date the person seeks election. Third, a candidate must have paid all of his or her monetary obligations due to the association. This includes not only assessments, but any monies accruing as a result of the delinquent assessments, such as attorney’s fees and interest, as well as other items that may be due such as a fine or even a cleaning fee. The candidate must keep their ledger “clean” through the date of election. But, once elected there is a little bit of a cushion. A director may not be more than 90 days delinquent in any obligation to an association. 1) REPRESENTATIVE. Be diverse in representation in the same manner as the community. As a recurring example, a board of directors composed of only retirees may not comprehend the day-to-day issues that face a community composed primarily of parents with young children. 2) PROFESSIONALS. It frequently helps to have one or more directors that have particular knowledge in the legal, architectural, engineering, and accounting fields. This said, most businesses operate very well without any of these individuals with practical experience, not that they would be called up to provide professional opinions or draft professional documents, which would be reserved for retained professionals. 3) MANAGEMENT. Interestingly, most community managers normally do not want to be a director in the communities where they live, but frequently they do not even want to be known to be a manager. Most managers recognize that there are frequently numerous avenues to a goal, and just as in the communities they manage, they do not want to second guess unnecessarily the manager where they live. 4) AVAILABILITY. If a prospect does not have the time to serve, then that person likely does not have one of the valuable attributes for public service. It is unfair to the remaining directors for a director to be absent, especially on a small board of directors, or in a situation where each director is assigned a building or portfolio. Of course, this does not mean that directors have to be available 24/7. There may be circumstances to be taken into account requiring temporary absence from the scene, hopefully for joyous occasions such as a birth of a new family member. 5) LOCATION. Increasingly, especially with the tools of modern technology, a director does not need to be physically present in the community. Directors can attend most meetings by telephone or video conferencing. This is not to say that a director should always be an absentee; how-ever, in many seasonal communities, directors are rarely in residence during the off season. 6) ATTITUDE. A key characteristic, but so difficult to evaluate, attitude is usually relegated to the bottom of the criteria list and frequently forgotten. This includes characteristics such as deliberateness, rationality, ability to communicate, and empathy. Consider why an individual wants to serve as director. Many times the person jumping up and down or demanding to serve does not have the calm, deliberative nature that is necessary for a director. What does a person desire to do as a director that the person cannot do as a volunteer? 7) PAYMENT. The desire to be paid or to reap financial benefit is frequently a quick disqualifier. Most associations are prohibited from paying directors to be a director. The balancing of criteria means that there is no one perfect formula. It has been thought that in many communities, the perfect director is an elementary school teacher. Why an elementary school teacher? They are individuals with a tremendous depth of patience, and the ability to take what appears to be a complex concept for his or her audience, whether youngsters or owners, and divide the concept into easily communicated and digested component parts. A teacher knows how to proverbially use a “hammer in a velvet glove,” keeping order among many individuals who are distracted and want to communicate at the same time without regard to others and each of whom may believe that their situation is more important than anyone else’s. And, above all, a teacher is a professional who strives to be at the top of his or her “game,” learning from every situation and handing off his or her charges to a successor in a better condition than he or she receives them. Other directors can assist with their business experience, including the ability to read and understand financial statements, hire and fire employees and vendors, and write for co-workers as well as customers and clients. How to entice good people to be directors is a topic for another essay, and perhaps a book. In the interim, consider that what usually dissuades volunteers is a perception that serving as a director is too hard a job. Perhaps the role of current directors includes educating owners as to a director’s proper role, which is that a director normally is not to be contacted away from board of directors’ meetings and is to retain professional management. And most importantly, the role of current directors is creating an environment nurturing future directors and keeping them! What happens if you fail to accurately complete an insurance application, not disclosing prior claims? Guess what? The insurer may rescind the policy, leaving you with a loss and no coverage. This is exactly what happened recently. A Florida appellate court ruled that the rescission of an insurance policy was proper because a homeowner lied in his policy application. The facts in Moustafa v. Omega Insurance Company, 41 Fla. L. Weekly D 2064 (Fla. 4th DCA, September 7, 2016) indicate that the homeowners made a claim for roof damage in 2005 and made another claim for water damage in 2007. In December 2007, the husband signed an application for a new policy with Omega Insurance Company. The husband did not disclose the prior claims on the application. To the question of whether he had any losses at this location in the past three years, or whether he had previous water damage, the husband responded “no.” In reliance on these representations, Omega issued the insurance policy. However, the policy provided that the insurer would not provide coverage for a loss if the insured intentionally misrepresented any material fact or made false statements. In 2010, Omega paid to repair additional water damage. It was only after the home suffered water damage in 2011 that Omega looked into the prior claims. When confronted, Moustafa admitted that he did not accurately fill out the insurance application. Omega rescinded the policy due to the material misrepresentations in the application about the prior claims and water damage. After the homeowners sued Omega for failure to provide coverage, the trial court found that Omega properly rescinded the pol-icy and granted judgment for Omega. 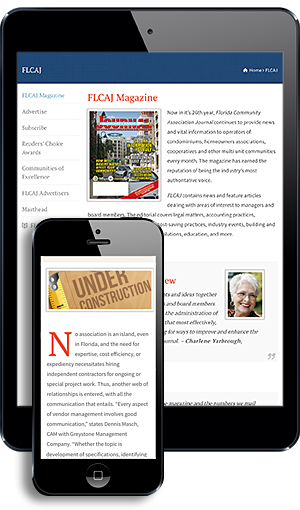 The Florida appellate court agreed with the trial court decision. The appellate court explained that Florida law allows an insurer to rescind an insurance policy on the basis of misrepresentation in the application! a) The misrepresentation, omission, concealment, or statement is fraudulent or is material either to the acceptance of the risk or to the hazard assumed by the insurer. b) If the true facts had been known to the insurer pursuant to a policy requirement or other requirement, the insurer in good faith would not have issued the policy or contract, would not have issued it at the same premium rate, would not have issued a policy or contract in as large an amount, or would not have provided coverage with respect to the hazard resulting in the loss. Section 627.409, Fla. Stat. (2007). Here, the court concluded that the misrepresentations were material because they prevented Omega from adequately estimating risk. This case is very important, especially for community associations, which often have numerous insurance policies. Insurance applications should be read before signing to confirm you have answered all of the questions accurately. Because applications may have been signed by predecessors, it may be worth it to go back and read these applications. If association property sustains a loss, that is not the time you want to find out that you do not have coverage!